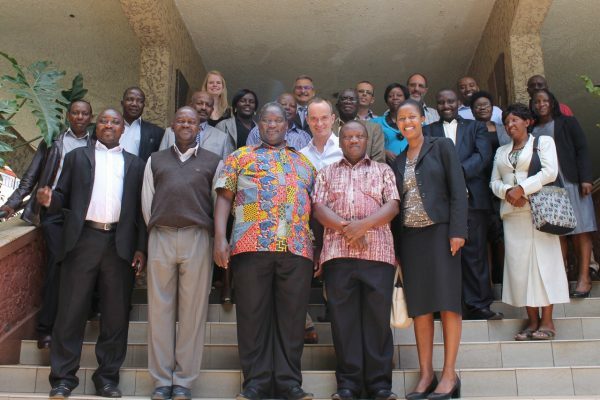 The Regional Access to Seeds Index for Eastern Africa was presented in Nairobi on February 19, 2015 to representatives from seed companies, national seed certification institutions, seed trade associations and other stakeholders from throughout the region. The meeting was organized by Cardno Emerging Markets, in cooperation with the Access to Seeds Foundation. Essau Mwendo Phiri, Chairman of the National Smallholder Farmers’ Association in Malawi and the moderator of the meeting, underlined the potential of smallholder farmers in crop production and the key role that seed companies play in providing farmers throughout the region with quality seeds. As recent research by Cardno shows, however, there is still a significant gap between smallholder demand and seed company supply. The Regional Access to Seeds Index for Eastern Africa aims to bridge this gap by highlighting best industry practices and feeding the dialogue on the role of seed companies in increasing smallholder access to seeds. Ido Verhagen, Executive Director of the Access to Seeds Foundation, provided an overview of the development process of the Access to Seeds Index. He explained that stakeholders in this process noted the important role regional and national seed companies play in providing access to seeds on a regional level. The decision was thus made to develop a Regional Access to Seeds Index alongside the Global Access to Seeds Index, starting with Eastern Africa. Dr Joseph Ahenda, Cardno’s Team Leader for the Regional Access to Seeds Index for Eastern Africa, presented the research on the regional seed industry that had been carried out over the previous months. Following extensive stakeholder engagement, for example through interviews with seed company representatives and farmer forums in Index countries, it became evident that the main obstacle facing smallholder farmers is access to quality seeds. The research was of great value for establishing clear criteria to define the scope and methodology for the Regional Index. The methodology encompasses seven measurement areas. Each measurement area is assessed with indicators classified along four lines: 1) commitment, 2) performance, 3) transparency and 4) innovation. During the meeting, Dr Ahenda presented the measurement areas and explained the extent and background of the specific indicators. At the end of the day, Francis Musau Ndambuki, R&D Manager for Kenya Seed Co., thanked the organizers. He underlined that the Regional Access to Seeds Index for Eastern Africa provides an opportunity for seed companies in the region to introduce themselves to each other and publicly demonstrate how they assist farmers in improving their business. The Methodology Report for the Access to Seeds Index will be published in early March 2015. It will include the methodology for the Regional Access to Seeds Index for Eastern Africa. Shortly after publication, the Index development will commence whereby seed companies will be engaged in the data collection process. Data collection and analysis will be undertaken by Sustainalytics. The Regional Access to Seeds Index for Eastern Africa is scheduled for release at the end of 2015.